This chapter describes how earlier images of cyberspace shaped the Internet’s development and discourses about it, especially the “cyberpunk” science fiction genre and images which viewed Internet freedom as a technologized neoliberal marketplace of ideas, before considering how economics, security, and environmental change are driving Internet futures. Using Google as a case study, the chapter finds that Internet companies shape what Richard Thaler and Cass Sunstein call “choice architecture” of online services to push the Internet towards corporate futures and encourage users to behave as predictable consumers. 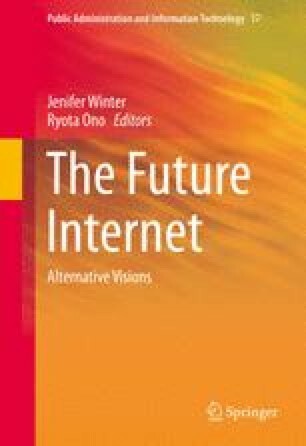 Additionally, the chapter argues that corporate futures constitute a monopolization of creativity evidenced by the recent creation of an alternative system of Internet governance based upon “multistakeholder” principles. The chapter ends by presenting three alternative scenarios for Internet futures based upon these drivers and trends; one in which the primacy of commercial interests construct the Internet as a centralized collection of services, one in which cybersecurity interests drive the Internet towards an aggressively securitized and surveilled system, and one in which environmental change causes the Internet to be regulated as a scarce resource.